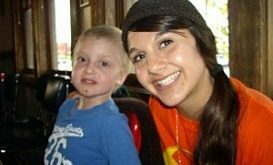 Do you know a child with cancer? Are you wondering what kind of gift to give them? As one who was on the receiving end for quite some time, I’m hoping to give a little insight on giving get-well gifts. There are do’s and don’ts- some are quite obvious, while others perhaps only someone who’s gone through it can realize. But all hope to ease that “what do I get them” feeling and create a better giving/receiving experience for both the patient and the people who care about them. Coming home from the hospital after a tough round of chemo, I’d slip on my fuzzy socks, grab my softest stuffed animal, and snuggle beneath my coziest blanket in my most comfortable pj’s. Comfort….it’s all about comfort. That’s why anything plush or fluffy goes over big with anyone who’s ill, especially a child. Whether it’s a big stuffed bear to hug during chemo or a pillow to jam your face in on hard day, the level of comfort that something soft can provide is overlooked. I have memories of struggle, before being instantly put at ease by my warm, downy blanket. Something so simple can create feelings of comfort and security in a time of chaos. This, in turn, gives the child hope, and therefore, more strength to keep fighting. So…what is the lesson to be learned? Don’t underestimate the power of softness!! While a first instinct may be to get the child his or her favorite foods, this is a big don’t as far as I’m concerned. There are many mini don’ts involved in this one. First off, you may not know of a special diet initiated by the child’s physician, making a gift of something that they cannot eat more of a taunt than a thoughtful get well wish. Secondly, chemo twists the senses so that smells and tastes have the potential to instantly turn the stomach. Also, perhaps the child has bad associations with the food you brought, and receiving it will evoke unpleasant memories. Lastly, even if you think that the receiver will be elated with that plate of their favorite cookies, chances are, you are ruining their desire for them. After their treatment, they may never want to eat them again because it was something they ate when they were sick. In short, leave it to mom and the hospital cafeteria to provide food for a cancer kid. This is a broad category filled with all sorts of options! Basically, anything that provides distraction for the sick child. This may be a toy, game, movie, ect…there are tons of things out there! There are just some basic guidelines. Whatever it is should be simple and not require the child to expend a lot of energy. There’s nothing worse than staring at your new gift wishing that you felt well enough to play with it. Sometimes little things like those urchin-looking balls that puff out when you squeeze them, are the perfect balance of simplicity and ease, yet distraction. I personally also loved when that easy, distracting “something” was productive. 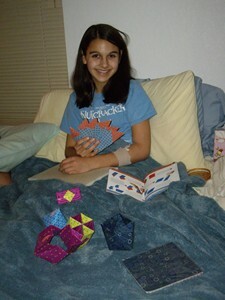 Puzzles, Rubik’s Cubes, and origami kits gave me a feeling of accomplishment while still bound to lying in bed all day. This helped me to feel good about myself, give me short term goals, and keep my focus on minute to minute activities besides things revolving around treatment. Yay for distraction! You’re probably asking yourself, “Huh? Smelly stuff??”. Yes…smelly stuff. Somewhat along the same lines as food, gifts that have a scent or even just a strong smell are, I believe, a big no-no. Cancer patients, especially children, have strong olfactory connections with treatment and feeling sick. Bubble bath, lip gloss, or even that doll that smells like strawberries may seem like a good idea, but soon bad associations with likely leave them collecting dust or thrown away all together. After the child has recovered, or even days after receiving the gift, it can be connected with bad memories and actually cause the child to feel sick when smelling it again. I found that the smell of the lip gloss I used often during my battle to find a diagnosis was far too disturbing to use afterward. It ended up in the trash, still half full. So, if you pick a possible gift off the shelves and find it emitting a strong and distinct scent, it is in you and your recipient’s best interest that you just put it back. Hopefully these do’s and don’ts have made it a little easier to find the perfect gift for a child with cancer. While all kids are different and may enjoy different things, these are the tips I have learned through my own experience. And when it all comes down to it, it is not so much what the gift is, but the love that is behind it that makes it special and meaningful. Next Are You at Risk for Ovarian Cancer? Thank you for the great ideas! 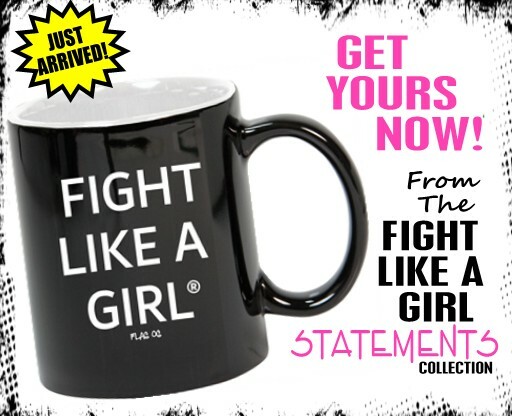 🙂 My mom has lymphoma….I’ve been wondering what kind of stuff she’d like. God’s Blessings in your recovery. Thank yOu so much for this article! I have juvenile primary fibromyalgia syndrome (jpfs) and othe medical issues that land me in the hospital pretty frequently and I agree whole heartedly with everything here! Distraction is a big one for me but I think my most important wish for a gift when I’m in the hospital is something cozy. When I got my gallbladder out, my BFF who also has jpfs bought me a stuffed animal that looks just like my dog and I now bring it with whenever I’m without my pup! These gift last for a lifetime and the thought that accompanies it is wonderful! Thanks again! I really admire you Melinda for hanging in there and helping others. I had no idea what to give a 10 year old boy with cancer. You have some suggestions for things that people might really need. This young man is a real trooper. He has had over 50 procedures in a two year space. Let’s encourage everyone to support Saint Jude’s Cancer Research Hospital in Memphis. I was going to buy scented pens and was googling for ideas for extra items for the care package. Thank you…I won’t get the scented ones! This article was really helpful, thank you so much. My best friends 8 year old was just diagnosed last month, and they’ve been in and out of Boston Childrens. I wanted to send them both a little pick-me-up… I had her covered, but I had no idea what to get him. Thanks for your ideas! And God bless. I wish you all the best in life, you are very strong person. These are great ideas! As a teen battling Leukemia, I can tell you that these apply to older cancer patients as well. I love nothing more than all the fuzzy and soft gifts people have given me. And you are right on with the smells and food thing! I ask people who are close to me to get me some kinds of snacks, but I often reject food that others make or bring for the very reason you said. There are a lot of things I will never eat when i am well because they remind me of being sick. I found a website that is for kids with sickness & injuries. They have a cute t shirt that says …. A little birdie told me I needed Tweetment . I thought it was cute, do you think a child would enjoy wearing a getwell shirt from BooBoo kids ? I found this article by doing a google search “best gifts to get a little girl with cancer” and I can’t tell you how much I appreciate this article. I am flying out next week to visit a friend from years back. Her 4 year was diagnosed with cancer in the fall. I have never had someone so close to me be diagnosed with cancer… the last thing I want to be is insensitive by bringing a gift that her daughter can’t use. This article really helped me navigate what I am going to bring for her girls. Truly, this is a great help. Thanks so much! I is totally dependable what cancer they have. The hospital that is treating my daughter for leukemia strictly forbids soft toys that can leave dust. Also playdough not accepted as it collects all sorts germs. These were very helpful suggestions. Thank you for sharing them. I pray that you are heathy and active.